Forthcoming article: "The Democracy Ratchet"
Litigants seeking to lift burdens on the right to vote and judges adjudicating these claims have an unremarkable problem—what is the benchmark for measuring the nature of these burdens? Legal theories abound for claims under the constellation of rights known as the "right to vote." And when a legislature changes a voting practice or procedure, courts may have an easy benchmark—they can consider what the right to vote looked like before and after the enactment of the new law, and they can evaluate a litigant’s claim on that basis. Recently, federal courts have been relying on this benchmark for the principal causes of action litigants might raise after a new law has been enacted—a Section 2 challenge under the Voting Rights Act, a freedom of association claim subject to the Burdick balancing test, and an Equal Protection analysis derived from Bush v. Gore. And frequently, courts have found that new laws that eliminate once-available voting practices or procedures fail. I describe this new practice as the Democracy Ratchet. But it is only recently that a convergence of factors have driven courts to (often unwittingly) adopt the Democracy Ratchet more broadly. So while a legislature can expand such opportunities, courts scrutinize cutbacks on such opportunities with deep skepticism—deeper than had no such opportunity ever existed. The ratchet tightens options, squeezing the discretion that legislatures once had. This Article seeks to solve the puzzle of how courts have scrutinized, and should scrutinize, legislative changes to election laws. Part I identifies recent instances in which federal courts have invoked a version of the Democracy Ratchet. It identifies the salient traits of the Democracy Ratchet in these cases. Part II describes why the Democracy Ratchet has gained attention, primarily as a tactic of litigants and as a convenient benchmark in preliminary injunction cases. Part III examines of the history of the major federal causes of action concerning election administration—Section 2 of the Voting Rights Act, the Burdick balancing test, and the Equal Protection Clause. In each, it traces the path of the doctrine to a point where a version of the Democracy Ratchet might be incorporated into the test. It concludes that these causes of action do not include a substantive Democracy Ratchet. Part IV turns to determine how the Democracy Ratchet might be used. It concludes that the Democracy Ratchet is best identified as an evidentiary device and a readily-available remedy for courts fashioning relief. It then offers suggestions for its appropriate use. Part V identifies some concerns with existing use of the Democracy Ratchet and instances in which it may be incorrectly used. It offers guidance for courts handling changes to election laws. Part VI concludes. Which Supreme Court justices are the topic of the most academic articles? A recent draft article about Justice Kennedy's influence and legacy sparked a social media discussion about which justices attract the most academic attention. I looked at the Westlaw database and searched for "ti(justice /2 [lastname])." The "ti()" field is slightly broader than just looking at the title of the article alone, but for this purpose it captured almost exclusively articles with a justice's name in the title. I didn't distinguish between Chief Justice Rehnquist's time as an Associate Justice (with that title), but I added a "chief" to my Roberts search to separate out hits for Justice Owen Roberts (there was at least one...). This search also would typically remove results for "the Rehnquist Court" or "the Roberts Court," which are less about the chief justices in particular, but it may slightly undercapture articles about those two justices. UPDATE: This methodology somewhat undercaptures references to justices that are more colloquial (e.g., use just the last name without the title "justice") or include the justice's name as an author without a title in a book review, but it eliminates far more false positives for most other justices who have more common names than "Scalia," "Alito," and "Sotomayor." I imagine there might also a logarithmic effect one might observe--or expect to observe--over the course of a justice's career. As a justice begins, few, if any, articles will be written about her; as her influence increases over time, we would expect to see more articles each year than the previous year. (There may also be separate bursts of scholarship around a justice's retirement and around a justice's death.) This metric is static and treats each year as the same--perhaps someone would spend more time analyzing year-by-year impact! 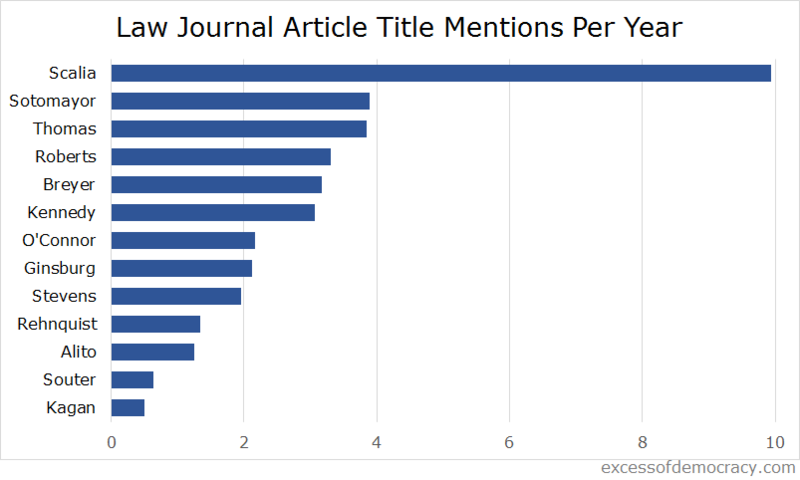 Additionally, the increase in the volume of journals, particularly online journals available on Westlaw, may skew results for justices with more recent histories. I narrowed my search to the "Law Reviews & Journals" database, which is broad enough to include some practitioners' publications and the ABA Journal but should work for a rough examination of justices. 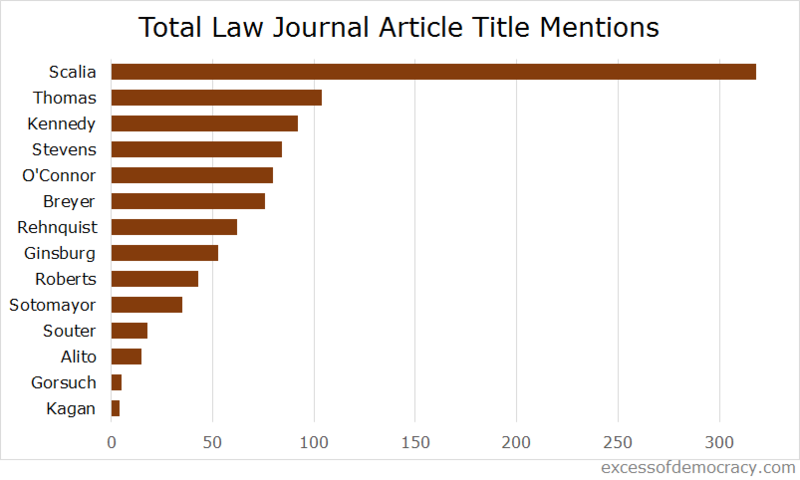 I then developed a charge, "Law Journal Article Title Mentions Per Year," with the denominator the years since that justice first joined the Supreme Court. I selected all of the most recent 13 justices (excluding Justice Gorsuch) to have served on the Court. UPDATE: I transposed the dates for Justices Sotomayor and Kagan in an earlier version, and their data changed slightly. I then added in Justice Gorsuch and looked simply at the raw citation totals, regardless of years' services. I'll leave it to others to discern what these figures might mean, if anything. I'll note that Justice Scalia dwarfs all others, which was not surprising, but a few other results did mildly surprise me. A few pieces about Justice Gorsuch were apparently written in his days as a prospective, or actual, nominee, then converted into pieces with a title about what "Justice Gorsuch," rather than "Judge Gorsuch," has written or said in the past--one reason his number is at 5 after one years' service, to Justice Kagan's 4. UPDATE: Dave Hoffman rightly points out that there are likely tens of thousands of law journal articles published every single year. Due to the search function in Westlaw, I could not even limit a search of articles mentioning "law" in a given year, because results cannot exceeds 10,000 hits, and I can't narrow the search database to Law Reviews & Journals in WestlawNext. Articles about a Supreme Court justice, then, are a tiny slice of all scholarship. UPDATE: And, of course, this is only a very crude metric that is assuredly overinclusive and underinclusive. But, the relative relationships between justices should be modestly illuminating. New essay draft: "Legal Quandaries in the Alabama Senate Election of 2017"
President Donald Trump’s decision to nominate Alabama Senator Jeff Sessions as his Attorney General resulted in a vacancy in the Senate and triggered a special election. The special election, however, revealed the many complexities of the Seventeenth Amendment, special elections generally, and Alabama state law specifically. This Article traces a series of legal quandaries that arose from the special election, some of which remain open questions for future Alabama elections, and for United States Senate elections more generally. Part I examines the scope of the Alabama Governor’s power to call for a special election under the Seventeenth Amendment and state law. Part II scrutinizes the complications for replacing a late-withdrawing candidate and for counting votes cast for a candidate who resigns. Part III identifies proposed gambits, from postponing the election to write-in campaigns, that never came to fruition. Part IV examines the timing surrounding certification of election results in Alabama. Part V looks at gaps in Alabama’s recount and election contest procedures. Finally, Part VI identifies the most significant opportunities to clarify Alabama law and to properly interpret the Seventeenth Amendment to avoid uncertainty in future elections. I have a very short turnaround before submitting the final draft for editing, but I welcome any comments or feedback! The 2016 presidential election brought forth new disputes concerning the definition of a "natural born citizen." The most significant challenges surrounded the eligibility of Senator Ted Cruz, born in Canada to a Cuban father and an American mother. Administrative challenges and litigation in court revealed deficiencies in the procedures for handling such disputes. This paper exhaustively examines these challenges and identifies three significant complications arising out of these disputes. First, agencies tasked with administering elections and reviewing challenges to candidate eligibility often construed their own jurisdiction broadly, but good reasons exist for construing such jurisdiction narrowly given ample political and legal opportunities to review candidates' qualifications. while litigation in federal court usually led to swift dismissal on a procedural ground, challenges in state proceedings sometimes led to broad—and incorrect—pronouncements about the power to scrutinize the eligibility of presidential candidates. Third, decision makers repeatedly mused about how useful it would be if the Supreme Court offered a clear definition of a "natural born citizen." This suggests that executive and judicial actors are uncomfortable with non-federal judicial resolution of a constitutional claim like this one. Finally, this Article offers a recommendation. After three consecutive presidential election cycles with time-consuming and costly litigation, it may well be time to amend the Constitution and abolish the natural born citizen requirement. Amending the Constitution is admittedly no simple task. But perhaps an uncontroversial amendment would find broad support in order to avoid delays and legal challenges seen in recent presidential primaries and elections.